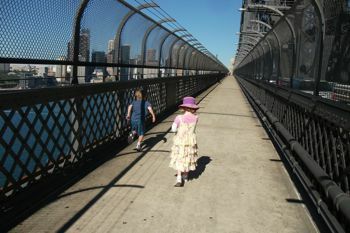 This is a stroller walk right across the Harbour Bridge, it’s a wonderful way to see the city and Harbour and the lovely suburbs of Kirribili and the Rocks. We’ve done this walk with a stroller many times, but in these photos the twins are walking over. This walk is very safe for the kids. That’s lucky as mine are very fast, great at climbing and terribly inquisitive. My kids enjoy seeing the water, boats and bridge, but the best bit about it for my wee boy was watching all the trains puffing by on the other side of the road. I must say I had forgotten how very noisy it is up on the Bridge with all those cars and trucks roaring past, that took a while to get used to. 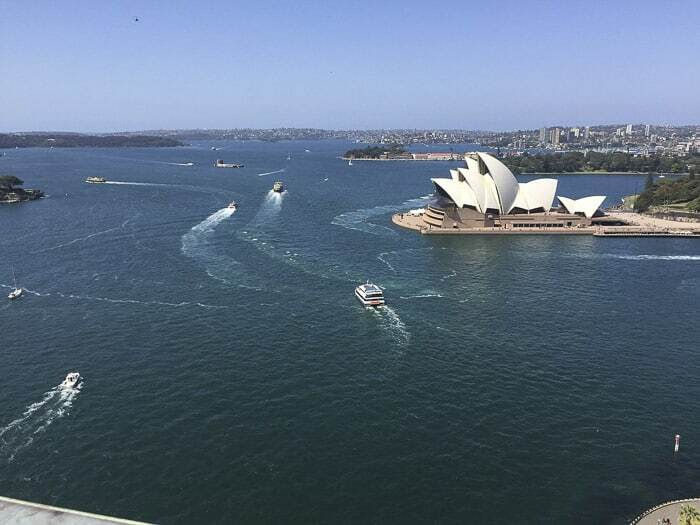 Walking over the Harbour Bridge is a must for visitors to the city. Although it is not the easiest walk to do with a stroller as there are steps, it can, and must, be done. You can walk from the Sydney city side to Kirribilli, then you can walk back. Or stop in Kirribilli for a meal or a play in the playground. You could catch a ferry back from Milson’s Point to Circular Quay instead of walking. An alternative is to catch the train from Wynyard to Milsons Point then to walk back towards the city. This makes for the best views so if you are thinking of walking just one way then I’d recommend this. There are long flights of steps up to the bridge walkway at the Kirribilli side. But with an unencumbered companion (or friendly stranger and you will find many) to help lift the stroller, these steps can be managed. This walk has fantastic views of the city skyscrapers and of the lower north shore with its bush-covered, jutting headlands. This a relatively easy walk and one that is guaranteed to lift the spirits and remind the walker of his or her great fortune to be in Sydney. And more. There are little expeditions on the far side which will delight the little ones. 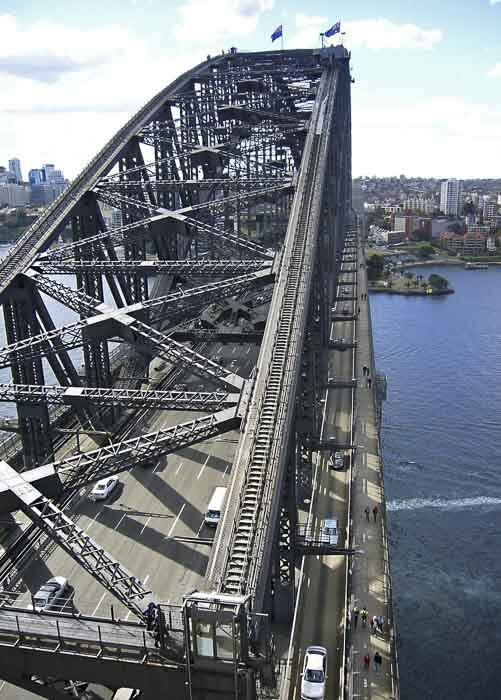 Walking children will enjoy this route over the Harbour Bridge. It is a safe walk since the fencing on both the road side and the water side of the walkway is both very solid and high. It is also a walk to inspire junior engineers. The wind can be quite strong on the exposed sections of the walkway, so it’s a good idea to bring an extra blanket for baby and clothes for walkers. There is very little shade on this walk. 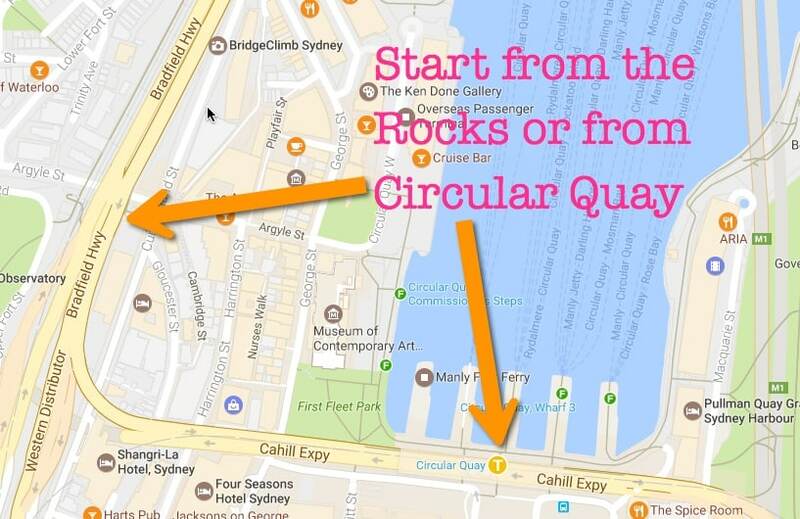 Start: You can either take the lift up to the Cahill Expressway from Circular Quay (it’s just beside the station entrance) or from the Rocks, take the The Cumberland Street Steps in Cumberland Street (opposite Gloucester Street), The Rocks. Parking: Ticket parking on both Gloucester and Cumberland Streets. Also parking stations on Harrington Street. In Kirribilli there is metered street parking around Broughton Street and free parking further back in the side streets. 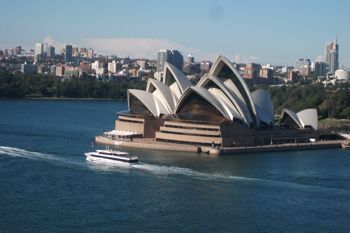 Nearest station: Circular Quay and Wynyard both are a 15–20 minute walk away. Kiribilli station is very close to the steps. 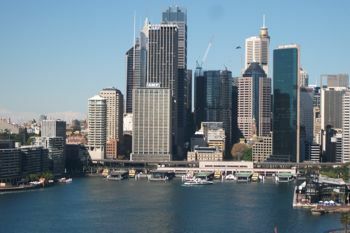 Nearest ferry: Circular Quay is a 15 minute walk away, on the north side Milson’s Point is very close. 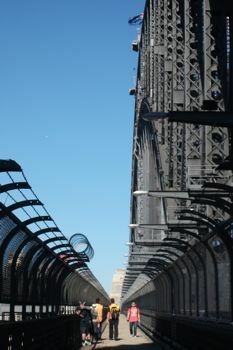 From the Cahill Expressway walk west until the walkway bends round to start to cross the Harbour Bridge. It can be noisy here. From the Rocks, take the Cumberland Street Steps, there are 74 steps in three long flights. Take it easy. The start of the walkway is ahead, but there are two more flights of steps which go right up to the roadside. Plaques on the wall commemorate the lives of those who died during the construction of the bridge. Cars, buses and trucks fly past at great velocity. The first section of the walkway is not in the slightest bit appealing, running alongside a concrete and barbed-wire fence. But as the path slopes up and the level of the roadway is reached, things begin to look much more scenic. Ahead is a huge stone arch, called the pylon, and the curve of the ‘coathanger’ rising beyond it. To the right and down far below lies Campbells Cove, where the tall ships berth and, behind now, the whirl of land and sea activity that is Circular Quay and the Opera House. The streets and trees of The Rocks are below, but not for long. As soon as the pylon is reached, the walkway stretches out over the water of the harbour and begins its gentle curve up. Under the archway is the entrance to the Sydney Harbour Bridge Pylon Exhibition and Lookout. There is a small charge to enter but under fours are free. The exhibition is in a room halfway up the pylon and the lookout is at the top of the total of 200 steps. Under fives are not allowed to go up to the lookout. A wide shot of the Harbour around the Opera House; how BLUE is that water??!! There is a bench beside the steps so one person can always wait outside with the littlies while the other puffs up the pylon steps to see the exhibition and lookout. There is a bubbler here and toilets are inside the pylon. Setting off again, the noise of the traffic can be intense and will take a while to get used to. Parents and carers of young children may need to choose a time when the traffic will be less heavy. Whistle for an easterly wind to blow all the noise and exhaust fumes away. The walkway continues its easy slope upwards and the views are now stunning. Ahead is Kirribilli and the gardens of the Prime Minister’s residence, Kirribilli House. Behind that is the bushy promontories of Cremorne Point and Bradleys Head. The gorgeous suburb of Kirribilli, great cafes and a lovely playground here on the north shore of the Harbour. In the harbour below lies Fort Denison and Shark and Clarke Islands. The eastern suburbs spread out: Watsons Bay, Rose Bay, Point Piper and Darling Point. And then there is Woolloomoloo Point, Mrs Macquarie’s Point and the sails of the Opera House. There might also be a huge cargo ship or a tanker chugging under the bridge itself. Yachts, dinghies and ferries of all sizes are cruising or working, or even racing. It is worth stopping several times to take in the view, and also to feel the weird sensation of the bridge moving underfoot. It seems to judder with the passing of the traffic and even to swing slightly in the wind. Sometimes, for all its tonnes of steel and the six million rivets, it does feel a little precarious. Those who enjoy making themselves feel giddy can gaze down through the fence at the long, cold drop to the water below. Children often enjoy looking up at the maze of grey steel girders that crisscross overhead. There is another bubbler under the northern pylon, and by now the walkway is slowly curving downwards towards Kirribilli, leaving the water behind as the bridge passes over the red rooftops of the little suburb below. At the end of the path is a long flight of 61 steps, the Bridge Stairs, which brings the walker down into Broughton Street. There are picnic tables by the roadside here. North Sydney Olympic Pool lies just below the western side of the Harbour Bridge. There is a large fenced playground with picnic tables in Bradfield Park, on the western side of the bridge. The walk can be extended by continuing under the bridge and down Alfred Street to Luna Park. A boardwalk leads around Luna Park to a path that follows the shore of Lavender Bay. At the wharf, turn right under the railway arches and ahead is Watt Park which has a super little playground, including an adventurously long slide and a rowing boat on springs. There is a wonderful swimming pool right below the Bridge, see North Sydney Olympic Pool. 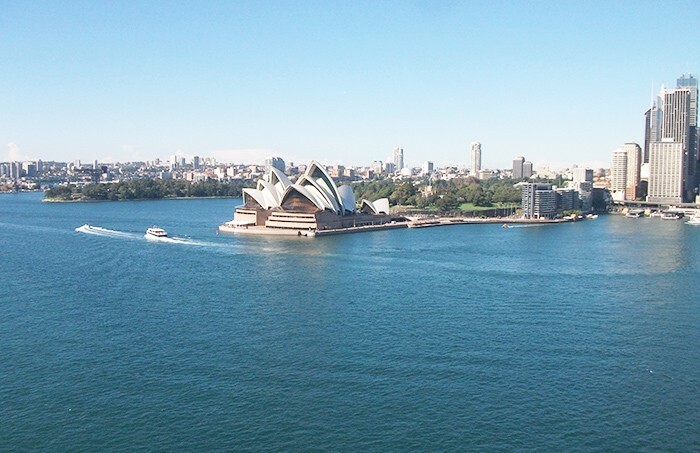 Walk back across the Bridge enjoying the wonderful views of the city, Harbour Bridge and Opera House as you go. Get down to ground level via the Cumberland Street Steps to the Rocks, or continue to the Cahill Expressway and take the lift down to Circular Quay. Here are some photos of my kids on the walk back to the city. Yes, I know, this part of the walk does look like the exterior of some scenic prisons! Views to lift the heart and mind; Sydney Opera House on a blue sky day. 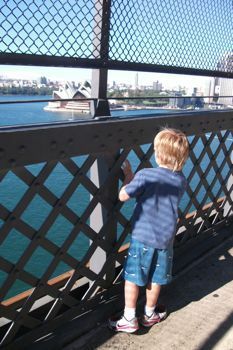 We’ve also climbed the Sydney Harbour Bridge, check out the post about that here. Would your children enjoy a walk over the Bridge? Where else do they like to stretch their legs and where is your very favourite stroller walk?